The staging of Mayaravan was a unique experience for Kochiites. KOCHI: When the matchless acting flair of danseuse Shobhana merged with the gifted voices of celebrities like Naseeruddin Shah, Jackie Shroff, Mohanlal, Revathi and Suhasini Manirathnam, the viewers were virtually taken to Thretha Yuga, the period of Sree Rama. This unique stage show, recently held at JT PAC, turned to be a crowd puller as it delineated the multi-faceted aesthetic sense of danseuse-actress Shobhana. Throughout the highly improvised script one could find the eagerness of an artist to lend versatility to the epic without losing its essence, thereby making it more comprehensible to the audience. The visual feast began with the striking dancing steps accompanied by the soulful rendering of the bhajan, ‘Sree Ramachandra Kripaalo Bhaj Man’. Then, Shobhana, in her own voice, narrated the entry of the crooked character Mandhara, the witch sent by Ravana to instill jealousy in the mind of Kaikeyi. 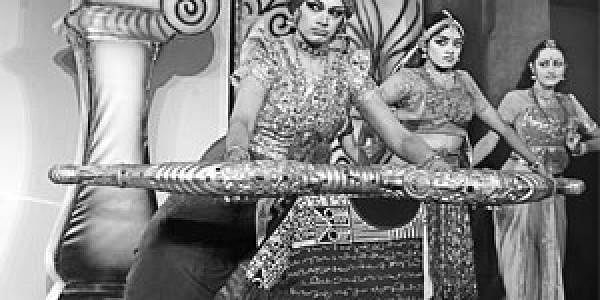 Within no time Shobhana assumed the role of Kaikeyi and accompanied by Mandhara depicted the most crucial scene of the ballet, which changed the dimensions of Ramayan dramatically. By skillfully applying the nuances in dance, Shobhana depicted the communion of the devil spirit of Mandhara with the subconscious mind of Kaikeyi. The very soul of the character Kaikeyi was brought alive by the crystal clear diction of Revathy and the acting potential of Shobana. The next scene portrayed the little known episode from Ramayana which depicts Ravana’s attempt to lift the bow meant for Seetha Swayamvaram. With much ease Shobhana imbibed the scene depicting the conversation between Dasharatha and Kaikeyi, literally transferring the inner struggle of the hapless King of Ayodhya, Dhasharatha, to the audience’s mind. In this scene Shobhana was assisted by Jackie Shroff who with his deep set voice exposed with ease the plight of King Dhasharatha. Then the ballet switched over to the forest scene where the lustful Shoorpanakha approaches Sree Rama. Here the choreographer adopted the distinct tone of Suhasini Maniratnam to lend a sweet voice to Shoorpanakha, disguised as a dazzling beauty. The dramatic entry of the golden deer was followed by the most crucial scene, abduction of Seetha by Ravana disguised as a saint. The abduction scene also portrayed the fight between Ravana and Jadaayu. The tear-jerking scene depicting the Ashoka Vanika (garden where Ravana kept Seetha) was quite touching with folk tunes played in the background and the visual beauty of the folk dance. The satirical tone of actor Mohanlal was apt for Lord Hanuman. Portraying the conversation between Hanuman and the monkey troupe, the actor beautifully improvised the slang by adding a touch of his inborn humour sense. In the next scene Shobhana presented the ‘Sethu Bandhan’. In the climax, Shobhana appears as Ravana. The conversation between Ravana and his wife Mandodari as Ravana confesses everything to his wife was quite interesting. While Shobhana, with her dynamic dance steps, immortalised the touching scenes of Ravana, the commanding voice of Nazeerudhin Shah lend a powerful personality to Ravana. Finally, after giving a day’s gap for Ravana to think about his past, Sree Rama kills him in a fight. Shobhana’s unique music and rhythm based choreography added an extra ordinary fragrance to the improvised version of Ramayana, viewed from an entirely different angle. With an exquisite shifting backdrop, stunning costumes and spectacular lighting, Shobhana with her 35 young and talented disciples of Kalaarpana, Chennai, made the two- hour long ballet a memorable show.